Warning! Warning! Caffeine overload! Sugar rush! I wish someone had cautioned me about the delicious overindulging that was about to happen upon my visit to Skybound Coffee + Dessert Lounge*. 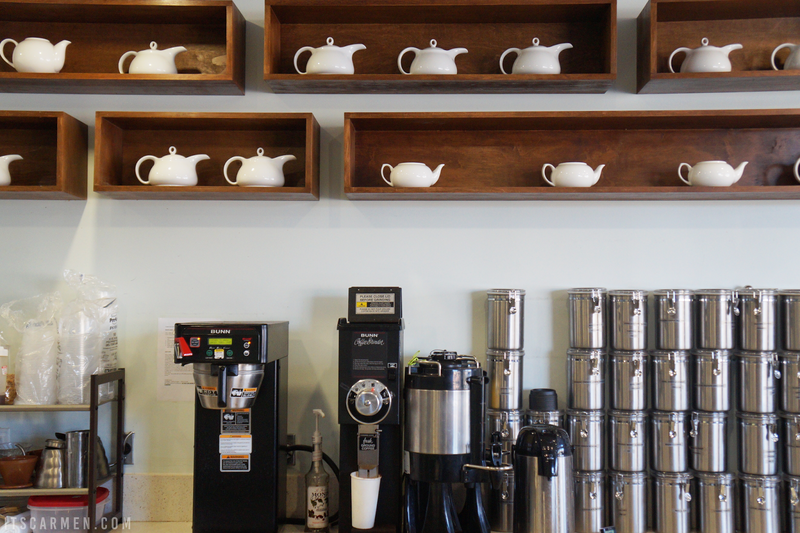 Skybound is the perfect destination for caffeine freaks, dessert hoarders, & foodies of all kinds. I was invited to come into their Vista location to give them a bit of a taste test. The lounge focuses on quality, well-sourced food & has two locations: Vista & San Diego. Let's enter, shall we? The atmosphere was open & bright. Natural light shone through the abundance of windows leaving you with a smidgen of sun & a touch of warmth. 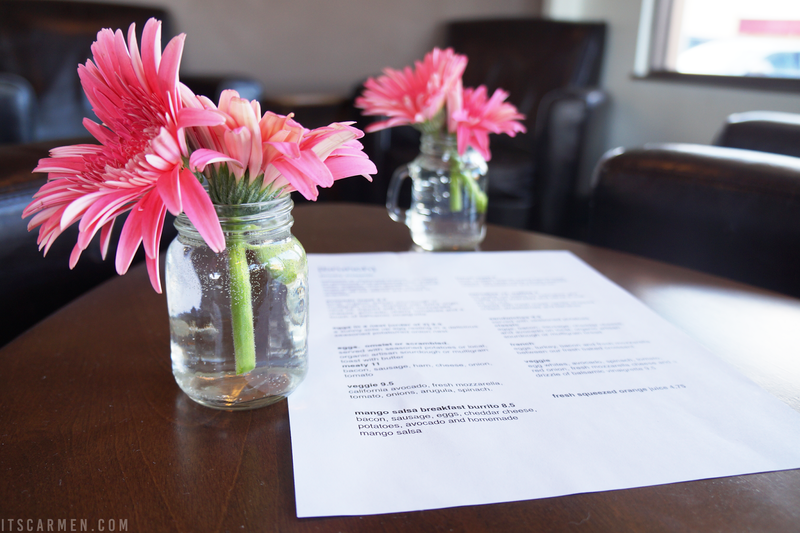 Tables decorated with bright pink gerbera daisies in mason jars gave Skybound a homey, relaxed touch. My boyfriend, Fred, & I were able to choose from ample seating. Music played quietly in the background; I'm pretty sure I heard Jack Johnson at some point. The friendly Skybound team seemed willing to answer questions & made our experience a positive one. Beth & Nancy were the ladies taking care of us; they were attentive & knowledgeable about the product. A consistent influx of people trickled into the lounge. As one person left another arrived & the cycle continued. It showed me that Skybound is a hit among the locals, a place people enjoy frequenting. 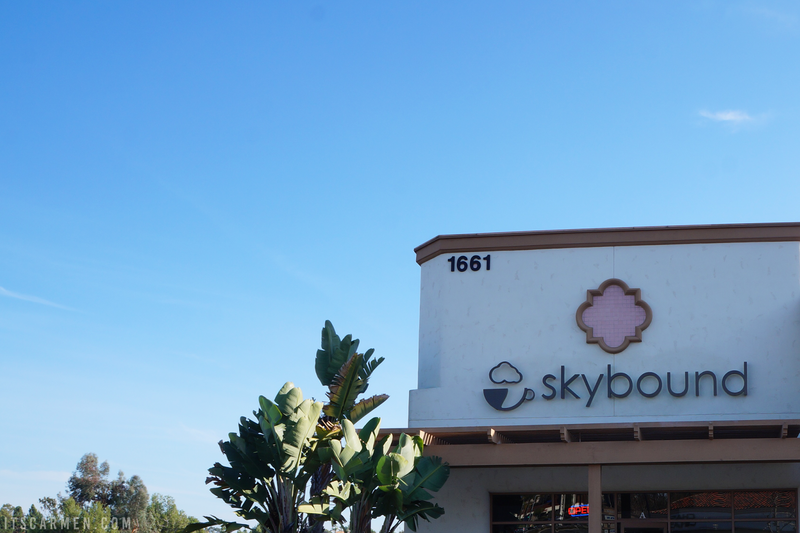 Skybound is situated near a high school, which factored into their decision not to sell beer or wine as they do in the San Diego location. Despite its proximity to the high school, the patrons vary in age — a woman in her 60s reclined casually on a cozy, padded chair; a man in his 20s sat facing the window, typing frantically away on this laptop. First up on the caffeine train was the coconut milk cortado, which is essentially a small espresso with a touch of milk. Although it's petite in size, it's potent & gets straight to the point. The cortado is perfect for a true coffee lover since its flavor & sheer amount of caffeine gives you quite a kick in the pants. Retails at $2.50. 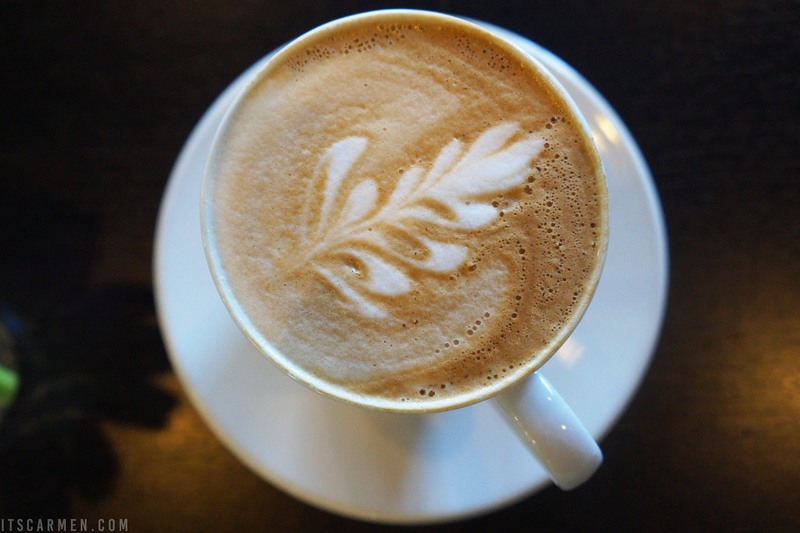 My personal favorite was the mocha with soy milk. It was beautiful, light, & airy. Rather than some sort of generic chocolate syrup, they use Dutch processed cocoa to create a rich but not cloyingly sweet mocha. This was one of the better mochas I've had in my lifetime. Retails at $3.25. For it's photogenic properties, they also gave me an Italian latte with regular milk. The milk apparently makes it easier to design latte art. 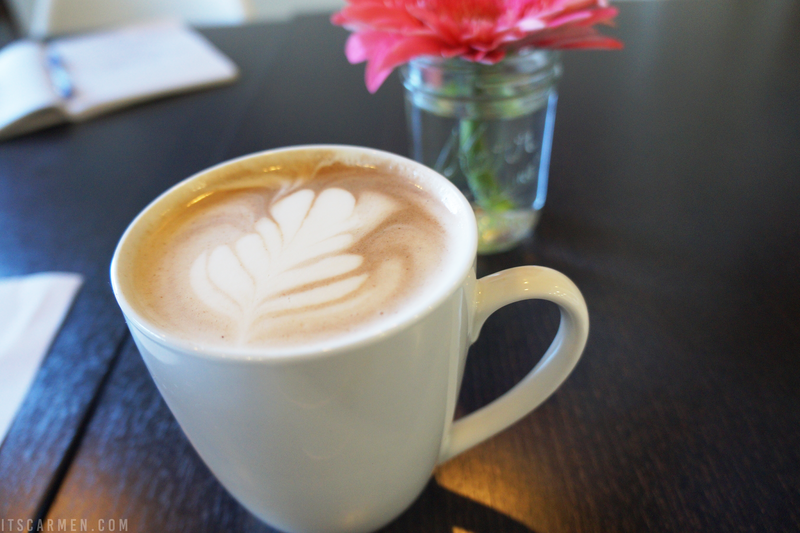 The latte was beautiful & perfect for Instagram photos! It had a nice head of foam & caffeine kick. Retails at $3.50. Incidentally, Fred & I visited Skybound on their very first day having a fully running brunch menu. How cool is that? I chose to vegetarian-ize the mango salsa breakfast burrito. It came with eggs, cheddar cheese, potato, black beans, avocado, arugula, & homemade mango salsa. The regular breakfast burrito normally comes with bacon & sausage. The fresh arugula gave it a nice crunch & zest. My boyfriend said it was filling, tasty, & scrumptious. 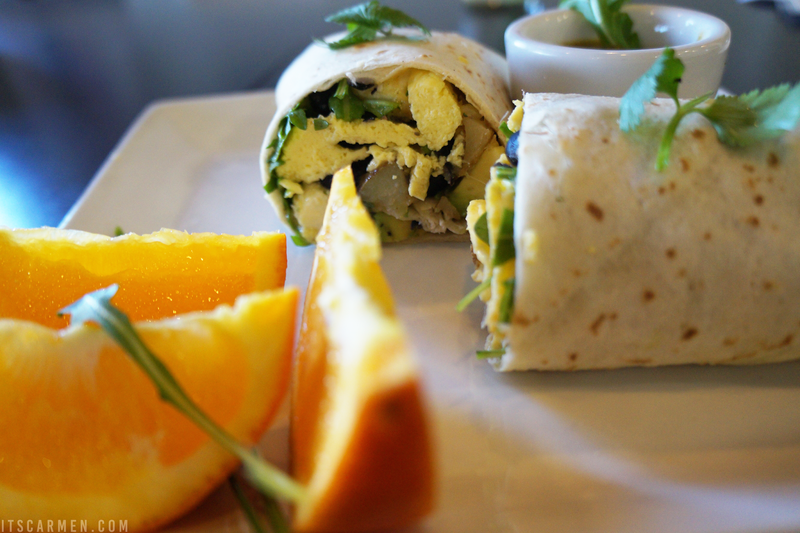 The mango salsa & the arugula formed such a different flavor & experience to the average breakfast burrito. Retails at $8.50. We also got the French toast made with local organic artisan bread topped with freshly made vanilla whipped cream, strawberries, & bananas. It was absolutely delectable with the maple syrup. The flavor & quality of the bread make it stand apart — not your average French toast. Retails at $9. After we stuffed ourselves for brunch, they gave us dessert! 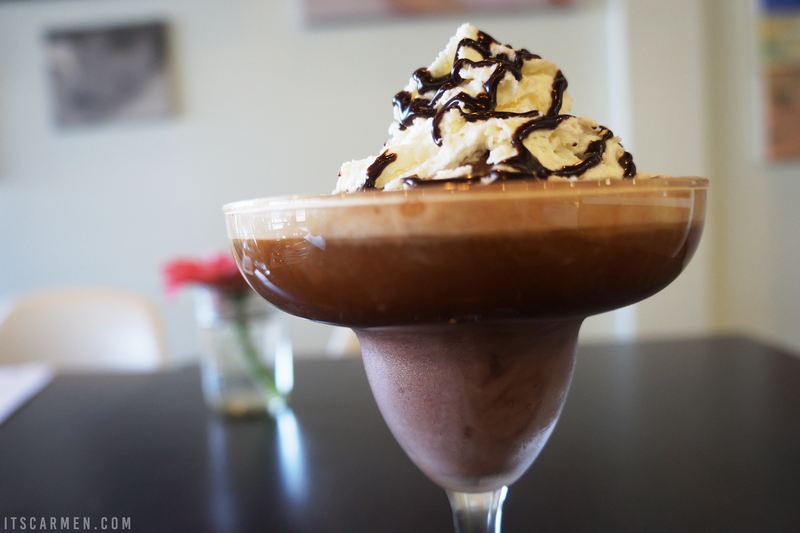 The affogato classico was a double espresso poured over chocolate gelato topped with whipped cream & dark chocolate sauce. It was intense. The balance of flavors melded into a perfect harmony. An affogato is a great choice to share with a friend or loved one. Retails at $6.75. By the time Chocolate Fantasy came around, I was hopelessly & utterly stuffed. We took a couple bites & boxed the rest to go. I consider it a chocolate lover's paradise. 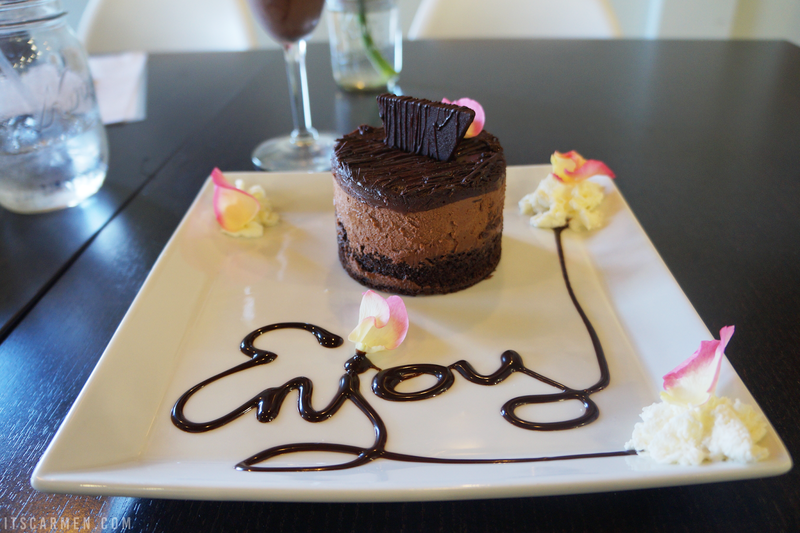 The Chocolate Fantasy isn't on the menu since it comes directly from a bakery & depends on what's fresh, but it's a moist chocolate cake layered with chocolate mousse, chocolate ganache, mocha paste, & espresso chocolate. Retails at $6.50. As if all of that wasn't enough, Skybound gave us two drinks to go: Thai tea & an iced sea salt caramel coffee. After returning home & crashing from all the sugar & caffeine, we took some sips of the drinks. My boyfriend preferred the Thai tea & I adored the sea salt caramel iced coffee. Both were extremely creamy, decadent, & thick. The Thai tea retails at $3.25 & the sea salt caramel at $3.75. The Vista location is nice, open, & the staff is friendly. My boyfriend said, "I'd definitely come back here." The standout pieces for me were the soy milk mocha, French toast, affogato classico, & the sea salt caramel iced coffee. Basically everything. 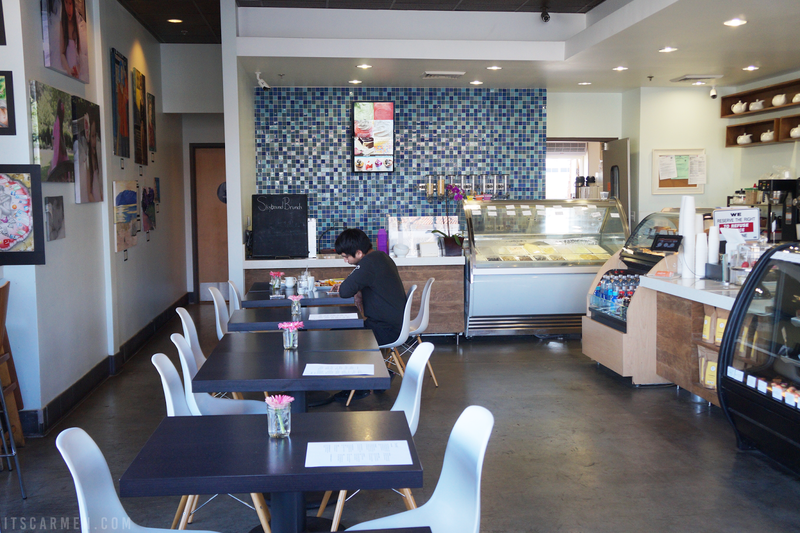 My boyfriend's favorites were the soy milk mocha, mango salsa breakfast burrito, affogato classico, & the Thai tea. Survey says: Skybound has all-around delicious drinks, desserts, & food. 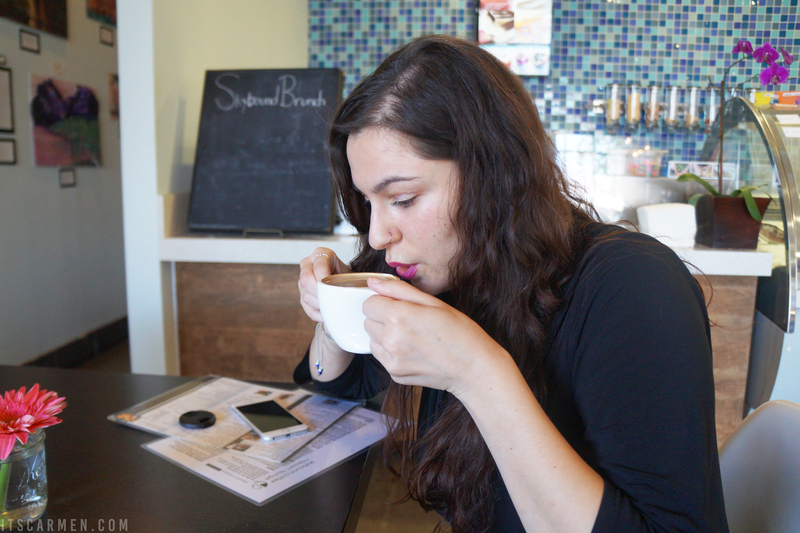 I genuinely had a marvelous experience at Skybound Coffee + Dessert Lounge & would return anytime. Hello Carmen, I really love this place, shame that I'm not in the US. Will definitely check it out if I travel there. I love exploring and trying out new cafes like this, I think it's actually one of my favourite things to do. I've never tried french toast before (except for the really crappy buffet kind) but that one looks incredible. Carmen, the places looks lovely and I'm loving the atmosphere, with its bight windows and warm interior. The mocha definitely looks like something I'll try if I ever got the chance to, and hey, the regulars seem to love the place, so that's saying something! This place looks like such a great place to be! The food and drinks all sound amazing, and the atmosphere and diverse clientele sound like the cherry on top :) You gotta like local places like these! The French toast looks SO good, as do the breakfast burritos. I'd love to visit on day! this looks like a great brunch spot! The food looks yummy! This looks like paradise to me. This looks so delicious! This looks like an amazing cafe! I wish I lived closer, I'm not a coffee lover but I'd be all over those desserts! mmmmm! Thanks muchly for sharing these, I've not been blogging for very long & I certainly would never have thought of putting a tittle on all my photos! So yummy! I want to dig in right now!!!! 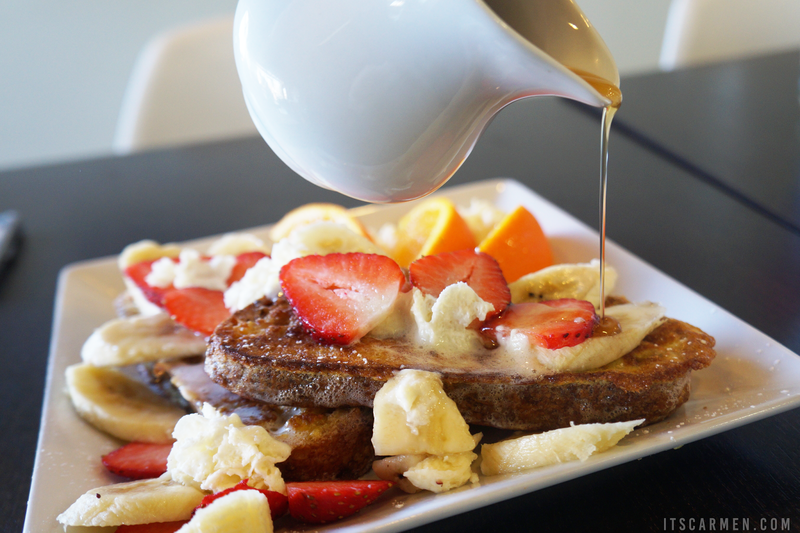 Mmmmm that french toast! Looks like you've had loads of fun at this place! oh my goodness that coffee & pudding looks incredible! so so good! Yum, that dessert looks incredible! 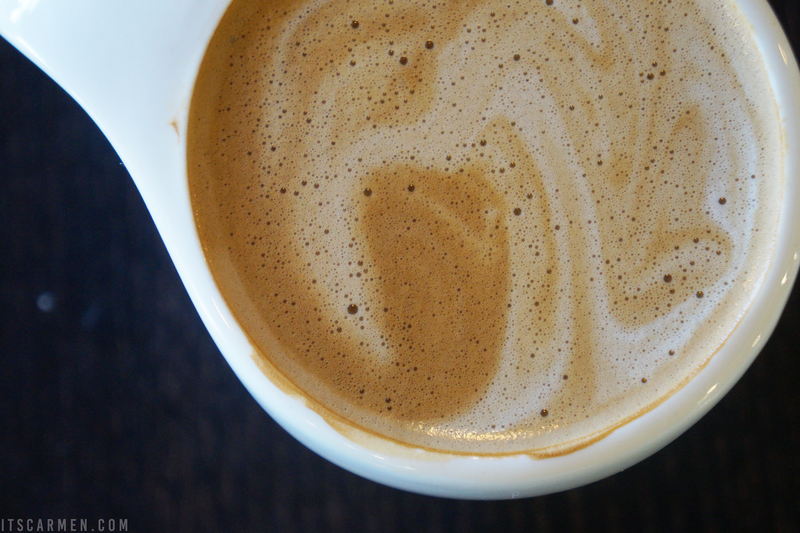 *swwons at latte art* a coconut milk cortado sounds HEAVEN! I haven't seen a coconut milk based on here in Vancouver! Oh gosh, Skybound looks soon cute! It's making me hungry for some sweets right now! I'd love some Sea Salt Caramel Coffee, that sounds incredible!! The french toast & affogato look soooo good & yummy! 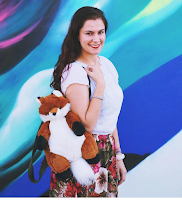 I'm really enjoying your blogging tips posts! They're easy to understand and I'm learning things I hadn't known...like titling a picture. Something so simple, but I wouldn't have thought to do that! Thank you for writing these and sharing your knowledge! !